If your organization is struggling to engage millennials, one of the things you’ll learn from this month’s webinars are 3 rules that will turn a new millennial member into a raving fan. If you’re having a hard time turning millennials into members, this Thursday’s webinar is for you. World renowned expert on millennials and author of Knowing Y: Engage the Next Generation Now, Sarah Sladek, shows you how successful organizations are attracting millennials. Engaging volunteers effectively provides a real benefit to your organization. Active involvement enriches volunteers and helps them feel they are making a difference. Money often follows involvement. In this webinar, Jeff Jowdy will give an overview of how to implement or improve an effective volunteer program. One of the biggest mistakes organizations make is in the stewardship between campaigns. We get so caught up in ‘the ask’ that we forget what drives people to give in the first place: relationships. And relationships take time, effort and a lot of love, so don’t wait until the last minute! Join us to learn how to maximize your efforts during the months leading up to a campaign to lay the foundation for success. How to get to know your donors and cultivate your network. Why a consistent communications plan matters. How to build a brand your community feels connected to. Steps to generate loyalty that will pay dividends. How to change the relationship dynamics with your community. What to do tactically to get the campaign set up early so you’re prepared. 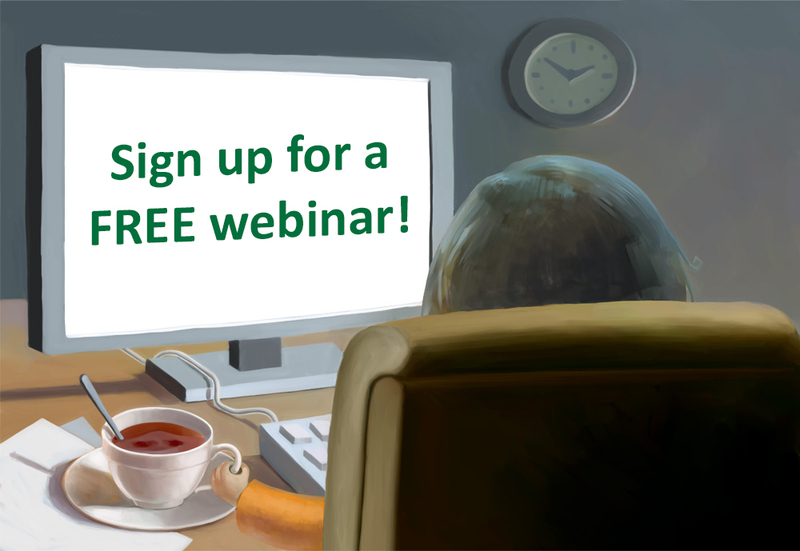 If you’re having a hard time growing your membership, you won’t want to miss our special free webinar this Friday. That’s because the webinar will reveal the surprisingly simple solution that thousands of organizations are using to drive membership growth to new levels. Growth Specialist Terry Ibele and bestselling author Donald Cowper will take you through the story of one membership manager who discovered this solution and used it to grow his organization’s membership 25% in the first six months. Your software is at risk. You may have figured out your configuration, cleanly migrated your data, and addressed all of the technical issues along the way, but if you don't have an user adoption plan, your database system is going to fail. Why? Because your software can't do much without the people who enter the data and put it to work on a daily basis. Learn how to help your organization and its staff members become software champions. During this hour-long webinar we'll share tips and best practices that nonprofits across the country have used to turn their staff members into proficient and enthusiastic users of their software systems. #GivingTuesday is the biggest giving day of the year and just three months away on November 29. We're kicking off the countdown with a webinar to teach you how to maximize the next few months to lay the foundation for a successful day of giving. Join Dana Ostomel, founder of Deposit a Gift and Firespring's leading authority on crowdfunding, to learn the 10 most important components to creating an empathetic, engaged and responsive community that is ready to help you knock it out of the park. We promise: You'll walk away confident about getting started planning your #GivingTuesday campaign. How to get to know our donors and cultivate your network. Why a consistent communication plan matters. How to establish a brand your community connects to. Steps to generate loyalty that pays dividends. How to change your community's relationship dynamics. What to do tactically to set up the campaign early. It goes by many names: electronic bidding, text-to-bid, or text-to-pledge. In the last 10 years, this technology has been heavily marketed to benefit auction planners. Vendors promise to transform your auctions by raising more money, streamlining checkout, and improving the guest experience. Some claim that your silent auction will raise as much as 50% more. But does mobile bidding really raise more money? Using several years worth of data from mobile bidding, this webinar synthesizes and shares practical “how-to” advice so you can make an informed decision as to whether you should consider using mobile bidding in your own charity auction. Participating in “Tips and Tricks for a Successful Grant Seeking Strategy” will provide you with insider knowledge about what funders are looking for and some specific tips you can use when reaching out to funders and crafting grant applications. Having served as a Program Officer for a statewide public foundation, Diane is uniquely qualified to help you best translate and understand the materials put out by funders. In this live nonprofit webinar we will go through tips and tricks that all grant professionals can use to help implement a successful grant seeking strategy in their organization. We will look at specific examples of how these tips can and have been successfully used so you can consider how to best utilize the information within your own organization. Participating in “Tips and Tricks for a Successful Grant Seeking Strategy” will give you some “insider” tips and tricks from the funder’s perspective that will assist you when working on creating and implementing your grant seeking strategy. Use the tips and tricks discussed in this webinar to ensure that you are putting together highly competitive grant applications and ultimately achieving your desired grant funding success. The term “strategic planning” gets attached to a wide range of nonprofit planning—for programs and services, budgeting, communications, information technology, etc. But these address very different kinds of issues, and should involve different participants, processes, tools, and products. We’ll look at the various kinds of planning needed by a nonprofit, see how they can intersect with and reinforce each other, and consider an approach that is more strategic, more effective, and less stressful. How to think about planning comprehensively. Why strategic, business and program planning are best kept separate. How to differentiate different planning needs, and how to integrate their results. With #GivingTuesday 2016 a bit less than three months away on November 29, it's not too early to start planning. We're kicking off the countdown with a webinar to teach you how to maximize the next few months to lay the foundation for a successful day of giving. Join Dana Ostomel, founder of Deposit a Gift and Firespring's leading authority on crowdfunding, to learn the 10 most important components to creating an empathetic, engaged and responsive community that is ready to support you on the biggest giving day of the year. We promise: You'll walk away confident about the tools you need to start planning your #GivingTuesday campaign. How to make the best use of your time leading up to #GivingTuesday. What to do to to keep up the momentum. How to cultivate a network ready and eager to support you. How to fire up and prepare board members, volunteers, donors and staff to spread the word. GrantStation is your one-stop solution for federal, state, and private grants research. Join Jeremy Smith, GrantStation's Communications Director, and Sara Kennedy, Director of Online Education, for a tour of the GrantStation website. This tour will provide tips on the most effective way to use all of the valuable resources the website offers, including the extensive funder databases that can help you identify the grantmakers most likely to fund your programs or projects. By using GrantStation's databases and resource tools, you can begin to develop a successful grantseeking strategy for the next 12 to 18 months. Ever feel overwhelmed by technology and the growing list of tools “every fundraiser should be using?” You're not alone. Many nonprofits feel like the ship has sailed, and they missed it. The great news: You haven't. We're all still learning. In this revealing session, you're invited on board as Marc A. Pitman talks candidly with Dana Ostomel about how crowdfunding fits in with your overall fundraising strategy and what you can do to start preparing for #GivingTuesday. How to determine if crowdfunding would work for you. The biggest mistakes nonprofits make with crowdfunding. Who should participate in #GivingTuesday. Examples of successful crowdfunding campaigns. Get the ins and outs of building your winning grant strategy for the year by joining GrantStation's CEO, Cynthia Adams for this free webinar (normally $69 through GrantStation)! This webinar will take participants through the process of establishing a grants calendar for the next 12 to 18 months. Fast-paced, and filled with action steps, Cynthia Adams, CEO of GrantStation, will discuss how to design and adopt a Grant Decision Matrix before beginning the process of building a specific grants strategy for each project. Before launching a facility project, nonprofit boards and CEOs should have a clear sense of the entire process, with its opportunities and pitfalls, so they can maximize value while minimizing costs, risks and stress. This webinar will address the critical information a board and CEO need to have, and the work they need to do, before hiring an architect. It will cover roles and responsibilities (board, staff, architects, contractors, consultants), strategy, planning, programming, budgeting, architect and contractor selection, and client-favorable contracts. How to improve the quality of the project while reducing its cost. How to create a two month strategic calendar. 3 top marketing channels to reach new audiences. How to fire up board members, volunteers, donors and staff to spread the word. 10 vital actions to cultivate a network eager to support you. How to generate loyal support long past the campaign. The goal of fundraising events is to engage your audience, connect them to your work and then compel them to the action of supporting your organization. You have to do this within the framework of limited time and attention from them. This webinar will walk through the strategy of your biggest potential fundraising moment at the event: the special appeal. We’ll evaluate how to choose an effective story and tell it in a way that compels donors to lean in and emotionally connect. As a nonprofit manager or executive you know project management tips and tricks – it’s your job. One of the biggest projects you may ever have to manage is an office move. The people, the computers, and all the moving parts that have to land in the right place and be ready to go from your new location on day one. As an IT manager, you keep the emails flowing, the data backing up, and the website live – it’s your job. One of the biggest challenges you may have to face is to manage an office move. Moment of panic when you “flip the switch” the first day? We’ve all been there. Join Community IT Innovators office move experts Gana Jiya and Rick Alloway for an informative and lively discussion of best practices to pursue, and pitfalls to avoid. We’ve learned a thing or two about moving in our 20+ years of working with nonprofits, and we want to help you get through it without tears. We’ll share our office move checklist with you to help keep you on track. And we encourage you to share your office move happy endings/disaster stories with us @CommunityIT before 4pm September 15th – we’ll discuss the best ones in the webinar. Office moves can be disruptive, but they don’t have to be frustrating or involve unmitigated downtime. Join us from 4-5pm September 15th for some good laughs at the worst that can happen, and some good insights into preventing disaster from happening to you. Are your social media posts reaching the people who need your information or services? This free webinar will help you see the outreach opportunities available via social media and outline actions you can take right now to improve your organization's reach. The board is humming in second gear – steady, showing up with clarity about its role, making solid decisions, taking care of business. You and the board leadership have worked really hard to get to this place. How do you move to the next level? The dimension in which board members are inspired and creative, as well as taking care of business in the fiduciary level. We will look at the characteristics of great boards, and how your board can make this move with intention and confidence. For Board members, Executive Directors, Deputy Directors, and anyone who wants to learn how to strengthen their board. Appropriate for any size nonprofit. 7 steps to online fundraising success. 5 metrics to measure fundraising performance. Attributes of a killer email marketing piece. 27) Is a Creative Bottleneck Killing Your Content Marketing Plan? Even the best content marketing strategy can be rendered useless without great creative. But too often the process of generating visually-arresting, memorable creative across all your content marketing channels is overlooked. Without an efficient means of not only creating, but reviewing, revising and approving your visual assets, your content marketing machine will grind to a halt. The best content marketers know that effective creative collaboration is critical to their success. Has your organization tried telling stories? Have your stories had the results you hoped for? Stories are an excellent way for non-profits to raise money and build relationships with donors. But not all stories are automatically great. There are a few key things that non-profits can do to tell better stories that get fundraising results. During this webinar with Vanessa Chase Lockshin, you'll learn 5 things that you can start doing today to tell better stories. When used effectively, crowdfunding is one of the most powerful tools in your giving day toolbox. And nowhere is crowdfunding more useful than on #GivingTuesday, a day specifically built for social media. In this webinar, Dana Ostomel, founder of Deposit a Gift and Firespring’s lead crowdfunding expert, will share everything you need to know about running a successful crowdfunding campaign from prep through appreciation. Dana will walk you step-by-step through the life cycle of a campaign and teach you the best ways to market your campaign to engage your audience. Best practices for setting up and marketing your campaign. How to cultivate your network via email and social media to pave the way for a successful #GivingTuesday. Why it’s vital to integrate #GivingTuesday into your overall end-of-year appeal. Strategies to excite and prepare your community about #GivingTuesday and help spread the word. Answers to YOUR questions during live Q&A. Whether you are brand new to the concept of corporate sponsorship or are a sector veteran looking for a more effective approach to creating quality sponsorship packages, you won't want to miss this free webinar. In this free webinar, sponsorship expert Chris Baylis will look at three case studies focused on sponsorship sales. These three case studies represent some of the common mistakes made when approaching sponsors as well as an example of sponsorship done right. In addition to the case study analysis, Chris will take you through sponsorship best practices, including how to build sponsorship proposals that close more sponsorship dollars. Perhaps you've heard of TechSoup before or attended one of our webinars. But did you know that TechSoup has hardware and software donations specifically for libraries? We do! This free, hour-long webinar is for library staff to ask the questions you want answered about our technology donation program. We will spend the first part of the webinar going over how to register for TechSoup, how our donation process works, and the hardware and software programs we offer to libraries. We'll also go over how to register all of the branches within your system and how to request bulk donations for your branches. After, we'll hold an open Q&A so you can get your library's questions answered. Does your library offer programs related to coding? Coding is quickly gaining traction as an essential digital skill in the 21st century, and many public libraries are offering coding classes for youth and adults as a way of promoting STEM education (Science, Technology, Engineering, and Math). The challenge is that coding is often a new skill for librarians and library staff who are responsible for offering programs. The good news is that you don’t have to be an expert in computer science to offer effective educational programs that teach coding skills. There are many free resources that can be used as a guide to starting a coding club at your library, no experience required. Come to this free webinar to hear about two examples of public libraries that have offered coding clubs using free curriculum provided by library partners. 35) We hate our name...but we're afraid to change it! how do you decide (once and for all) that you have a problem? how do you know whether to evolve or completely change your name? how do you choose a new name? do you need a tagline? how do you roll out a new name?